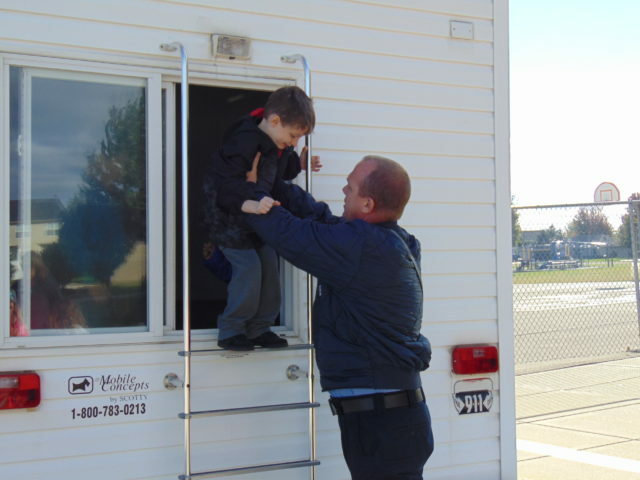 Firefighter Chad Cunningham assists a Seth Whitman Elementary School second grader to ‘escape’ through the window of the BFD Fire Safety House. 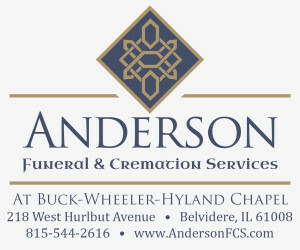 The Belvidere Fire Department spends October of each year, Fire Safety Month, sending firemen to every second grade class of Boone County School District 100 to educate the students in fire safety and the role they play. On Wednesday, Oct. 17, Firefighters Dan Drall and Chad Cunningham were visiting the second grade classes of Lincoln Elementary School. They spoke with four classes while on the premises, educating 92 children. The two firefighters split the class, Firefighter Dan speaking to the kids in the classroom while Firefighter Chad took the other half of the class out to the mobile Fire Safety House. FF Dan began with basics to find out what the kids already knew then reassured them that if they did their part, he would do his. “If you make noise, I will find you 100 percent of the time. He then took the kids into another room where a little smoke was released so the smoke detector would go off. When the smoke detector went off, the kids practiced getting out of a ‘burning’ building by climbing through the window. They all went to their meeting place, counted, and found everyone was present and accounted for.